Anyone who knows me, can attest to the fact that I am not a large drinker. In fact, wine is about as strong as I go these days, mostly out of the stigma that comes from a “church girl” indulging in alcohol, but also compounded with the fact that I just don’t like the way a lot of alcohol tastes. After a web search and a couple of phone calls to various beverage depots, I found a spot that was close to us and relatively inexpensive (did you know that bottles of alcohol are as expensive as they are?! SHEESH!) I gathered all of my ingredients to bring forth this cocktail. 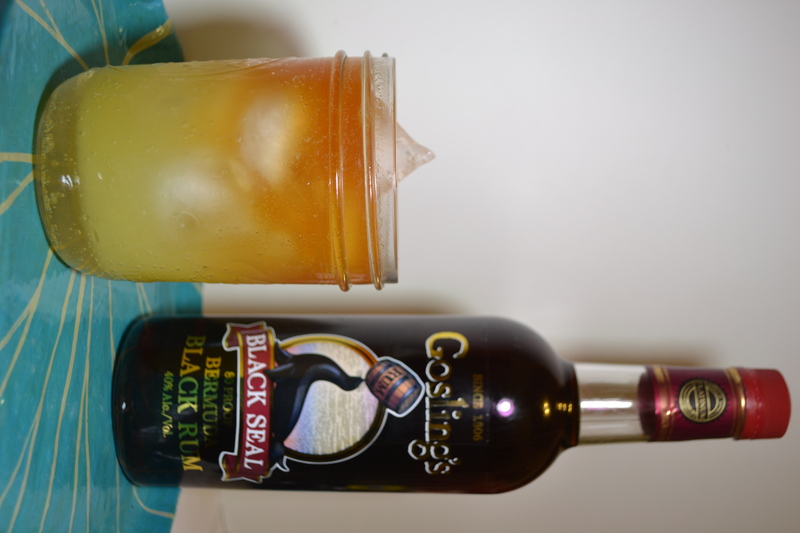 You’ll need, Goslings Black Seal Rum, Ginger, Sugar, Limes, Club Soda, and Orange Juice. I was able to make Ginger simple syrup, and it’s YUMMY! I can totally see making spritzers with just that and the club soda, but I digress. The neat thing about this drink is that it’s layered. Simple syrup on the bottom, club soda, orange and lime juices in the middle and the rum floating on top. I also got to serve it up on the great Heart of Haiti tray from Macy’s! I did more of a southern feel with my drink, serving them up in mason jars, and I must say, it still packs a punch. I’m sure that those who are a little more well versed in drinks that can put a little bit of hair on your chest, would think that the way that I prepared it was slightly weak, but for now, that’s about all I can take. Of course, I think that this would be a great addition to your first full spring barbecue with friends. It’s easy to make, and your friends will be impressed with your bartending skills. Take two tablespoons of the ginger syrup and pour it down the sides of the glass so that it settles on the bottom. Carefull ‘float’ two tablespoons of the Goslings Rum on the top of the drink. Garnish with a lime wedge and some candied ginger and serve. Tell your guests to stir their drinks before enjoying! There you go – a great cocktail to start spring! Enjoy! Nae, this is exactly the rum that started the whole Dark & Stormy movement. I did my research like a good nerd! Oh my gosh, this looks sooo good. Need to try this one of these days. Thank u. It was good. I also decided to make straight gingerale with just the simple syrup and the club soda, and that was good! I’ll probably use that recipe for a birthday party for the little ones. And you’re more than welcome!